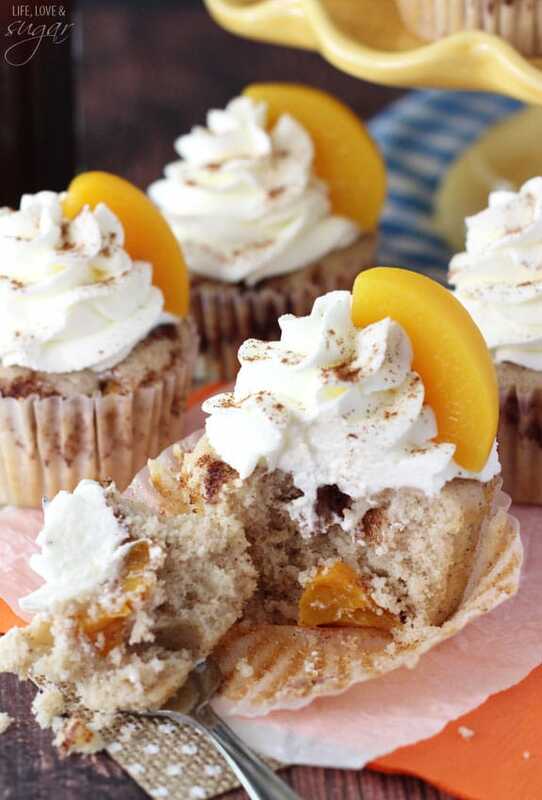 These Peach Cobbler Cupcakes are a fun twist on a classic southern dessert. 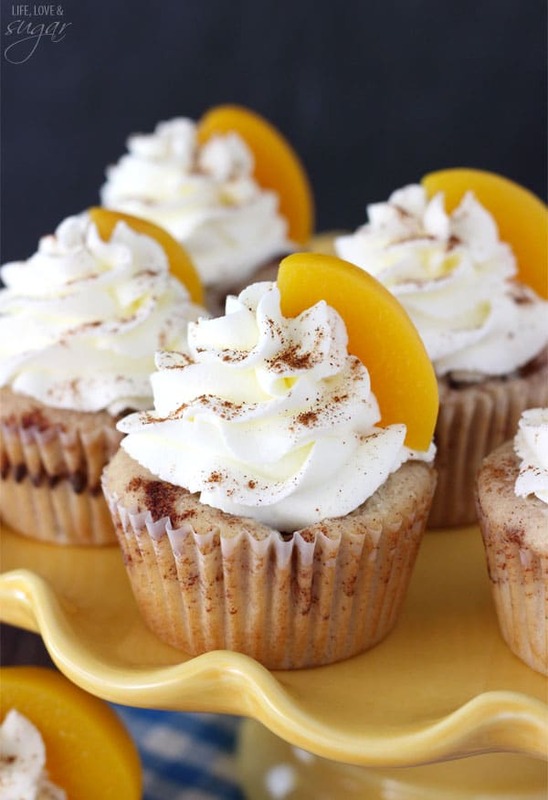 The cupcakes are full of cinnamon and peaches and topped with whipped cream! You may remember from last week that I’m working with ALDI for their Summer Road Trip. I’m sharing all about Atlanta with you as one of the five cities they are virtually “visiting”. Last time, we talked all about the food, so today we are talking some fun activities you can do while visiting! So let’s talk about some of my favorite things to do. Stone Mountain Park – It’s located right outside of metro Atlanta and is just as it sounds – a mountain made of stone- quartz to be exact. There are all kinds of activities that are great for families, including a skyride to the top of the mountain that gives beautiful views of the Atlanta skyline, fishing, hiking and an awesome night-time laser show that ends with fireworks. We’ve seen the show and it really is awesome and totally worth it. 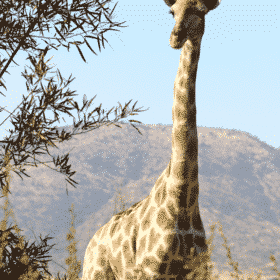 The park would also be a great place to take a picnic with some of your favorite ALDI foods. They have great meats and cheeses for sandwiches and they even carry Kings Hawaiian bread (one of my faves), which is great for sandwiches. Chastain Memorial Park – This park is the largest in Atlanta. There are jogging paths, playgrounds, tennis courts, and my personal favorite – the amphitheater. The amphitheater is only open in the summer, but always has classic artists. Remember when I went to the Boyz II Men concert last summer? This is where it was. It’s a completely unique atmosphere and experience. Unlike any other amphitheater I’ve been to, you can bring in your own tables, food and coolers. Many people will even bring tablecloths and vases of flowers. It’s the perfect place to bring your favorite bottle of ALDI wine, and some ALDI cheese and crackers and enjoy a show. 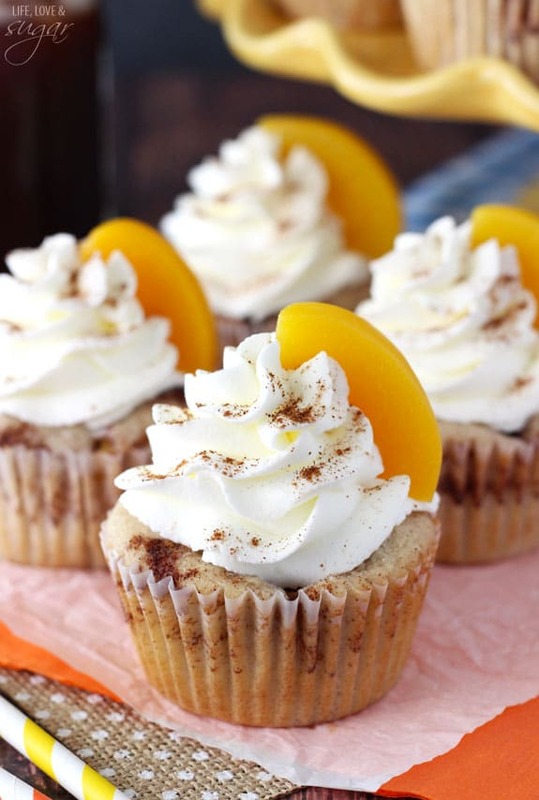 And speaking of the Peach Cobbler Cupcakes, let’s talk about them a little bit. I gathered all my favorite ALDI baking products to put these together. I used a modified version of my favorite vanilla cupcake. I reduced the milk a little to have a little bit thicker batter. I tend to think of cobbler as being a little bit of a thicker cake, plus I wanted to offset some of the moisture from the peaches and make sure they didn’t all sink to the bottom. 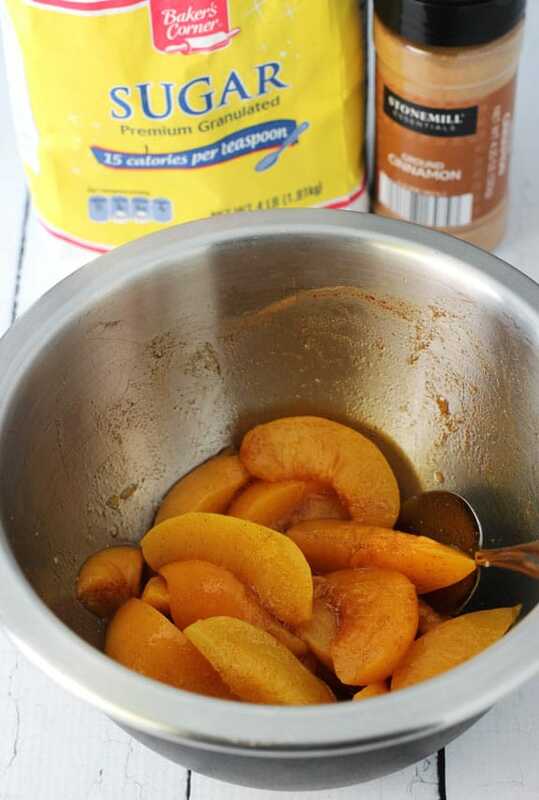 Once the batter is mixed, grab your peaches, cinnamon and sugar and combine them. I used canned peaches, but if peaches are in season and ALDI has them fresh, you can grab those too. Cut each of the peach slices in half so that they are a little smaller and fit better into the cupcake liners. 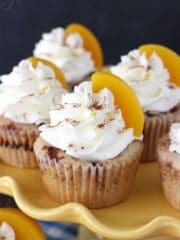 Put 2-3 pieces of the peaches in the bottom of the cupcake, fill the liners about 3/4 of the way with batter, then top with a little sprinkle of additional cinnamon and swirl that around with a toothpick. I absolutely love cinnamon, so I’ll always add a little extra wherever I can. Top the batter with another 2-3 pieces of peach, then pop them in the oven. They are absolutely delicious! Especially when warm, it’s like eating a little mini peach cobbler. In fact, once they’d cooled and I’d topped them with homemade whipped cream, I’d warm them up for about 10 seconds in the microwave before I ate them. The cupcake got a little warm, the whipped cream just starts to melt and it’s just like eating a warm peach cobbler with some whipped cream. Heavenly! 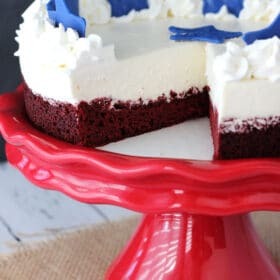 And such a fun twist on one of my favorite southern desserts! If you ever come to Atlanta, be sure to check out some of those fun activities. And whether or not you visit, these cupcakes will give you a fun taste of the South! I’ve included their brand names in the ingredient list below to help you find them in store. Happy Baking! Follow the ALDI Virtual Summer Road Trip to discover regional flavors at your local ALDI. To learn more about ALDI and find seasonal recipes, ‘Like’ ALDI on Facebook. 2. In a medium sized bowl, combine ingredients for peaches. Cut peach slices in half. 3. 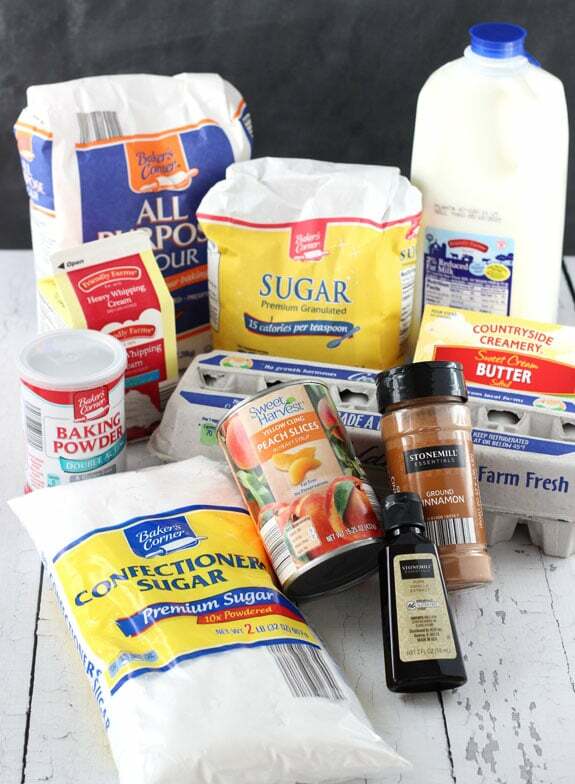 Whisk together flour, sugar, baking powder and cinnamon in a large mixing bowl. 4. Add butter, egg white, egg, vanilla and milk and mix on medium speed just until smooth. Do not over mix. 5. Add 3 pieces of peach to the bottom of the cupcake liners. 6. Fill cupcake liners about 3/4 of the way full with batter. 7. Sprinkle some additional cinnamon on top of batter, then swirl with a toothpick. 8. Add another 3 pieces of peaches to the top of the batter. 10. Allow to cool for 1-2 minutes, then remove to cooling rack to finish cooling. 11. To make whipped cream, whip heavy whipping cream until it begins to thicken. 12. Add powdered sugar and vanilla extract and whip until stiff peaks form. 13. 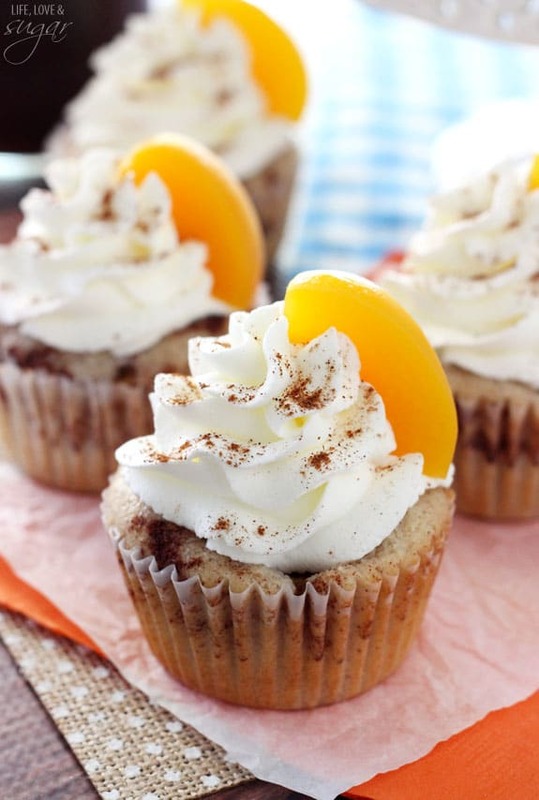 Ice cupcakes with the whipped cream and a sprinkle of cinnamon. 14. Store cupcakes in the fridge until ready to serve. Can be served warm by reheating in the microwave for about 10 seconds. Makes about 12 cupcakes. 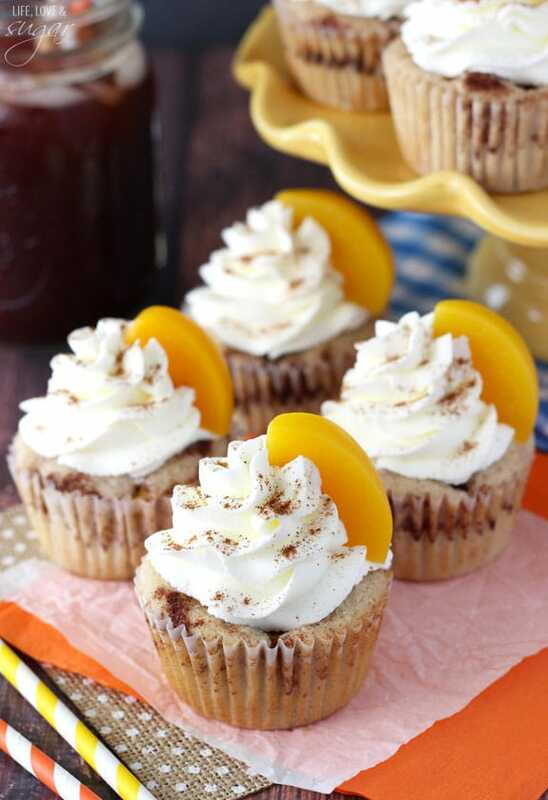 *If you want extra peaches to be able to top your cupcakes, you’ll need a second can of peaches. I’ve always wanted to visit Atlanta, so I read about your sights with a lot of interest. It just seems like such a nice city! These cupcakes are very Atlanta. I mean, isn’t one of your famous streets called Peachtree? Or am I getting that wrong? At any rate, they look so amazing! Love these cupcakes! Peach cobbler is the best. And now I can have it in a cupcake. Incredible! What a fun twist to traditional peach cobbler! Umm I have to have these RIGHT NOW!!! Sounds like a delicious cupcake! I love peach cobbler! Do you think this recipe would be OK using fresh peaches instead of canned? What would your suggestion be for a substitution?? Yes, fresh peaches will be fine. Wow! 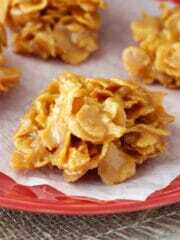 Great combination, your recipe is very creative. The cupcakes look awesome. I think they are heathy enough and super yummy! Thanks for sharing! I’m a very picky cook and I will say I have never had to alter, tweak, or change a single one of your recipes. Another amazing recipe! I’m trying this recipe this weekend , I just wanted to know can I add pecans to the cake batter? Yes, pecans should be fine. Thank you for this, you just helped my mother a bunch with this recipe ! Wow, I love this cupcake. 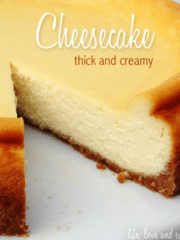 Thank you for sharing this recipe and tips.